Wow, the biggest event in my comedy career has just happened. I have just been invited to perform in the Great American Comedy Festival in Norfolk, NE. I’m speechless right now. There are many comedy festivals out there, but this is one is the gold standard. It was started in the mid 2000s to pay tribute to Johnny Carson, whose hometown was Norfolk. The comedians either are chosen through comedy contests or are handpicked. They are flown out to Nebraska, put up in hotels, and paid to perform for the weekend. That’s what makes it the gold standard I mentioned earlier. Most comedy festivals make you pay your own way and you definitely don’t get earnings. Not only that, many will even make you pay an application fee to be considered. Anyone who’s ever done it raves about it. 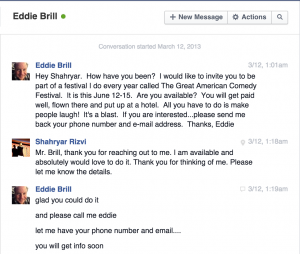 The contest is run by Eddie Brill. I opened for him at the Trump Country Club in Leesburg, VA last month and the show went well. I guess he made his decision just based on that. Right time, right place, a good crowd, and a lot of luck. Really excited. Can’t wait until June.